Great to learn you’ve already accessed the “incredible pictures” contained in the Catalog. Since you would not let me off the hook but still want two mails that I promised, I’m willing – though not sure I’m that able – to “shine some light” on the Catalog’s contents. The two essays in the Catalog are eye openers because I knew very little about adire even though I love them. John Pemberton’s write-up takes one to the classroom, going into great details about the different techniques of how the textiles in the Beier Collection are made and even their uses. I particularly love the excellent photographs of women at work weaving or dyeing cloths, and the dressed-up “babas”, in your words, of Ila-Orangun. Your first question: Why is the “Agbada, hat and trousers” on Plate 34 described as “Etu (indigo) andAlaari stripes” when I do know – thanks to you – that “etu is not a cap style but one of the three Yoruba classics?” In the Professor’s essay, he also makes it clear that “Alaari … a rich reddish, handwoven cloth …” Is there a category of alaari and etu as one cloth as implied by the illustrator? Alaari is ALWAYS a dominant red with thin stripes of beige, green or yellow depending on the area of Yorubaland. The Ondo people, for example, tend to love stripes of greens and/or yellows combined with the dominant red while many areas prefer the dominant red with stripes of beige. In the Catalog, though, I think you should take the “etu (indigo) and alaari stripes” as artistic expression! You can see in the magnificent pieces in Figures 11 and 12 that the etu and alaari agbada are so named and while it’s not stated, the other man in Fig. 27 wears the third classic, sanyan. Auntie, are the so-called classics very recent? I notice that the oldest textiles or clothes in the Catalog date back only to the 50s? Well, dear, I understand your concern. Allow me to re-state as I wrote to correct you when you mentioned a governor “who sews all his caps into etu style” some years ago that Alaari & etu – two of the three true classics are labelled while sanyan (dominant khaki color with white stripes) is not labeled but see the last line of the last answer. The three have definitely been around before the 20th Century. They have been passed down from parents to children for generations. My father was never into big clothes but one of my husband’s older brothers, now in his 70s, owns my late father-in-law’s sanyan. The designs of the three do not change; weavers do NOT introduce new colors, and all are worn for great occasions – marks of true classics. So adire’s invention is 20th Century? Beier and his first wife, Susan Wenger (Adunni Olorisa) could be right about adire beginning around 1910 [Wenger and Beier, 1957:212] but I wouldn’t know. We have an old photograph of my husband’s maternal grandmother whose outfits included an adire wrapper; photograph taken in Kano around 1920. As you know, Osogbo was a center of adire and before my late father-in-law became the Ataoja on April 4, 1944, he had made part of his wealth from the trade beginning from when he was still a Travelling Teacher based in Benin City in the late 1920s. The oriki of Osogbo: ilu aro (home of indigo dye,) derives from this past. And your second question as last: Professor Abiodun dazzles, Aunt Tola, but in spite of the ample translations he gives, it’s depressing I cannot really read the Yoruba Ifa, etcetera. I’m sure they must be gems. And my Yoruba is quite good! Could you sort of walk me through? I left the business of teaching long ago, dear, and cannot, therefore, assess your Yoruba language skills but I agree with you that the essay does captivate and this is to be expected. Naturally, Abiodun sees the textiles from a different angle from Pemberton whose impressive knowledge and long commitment are commendable. 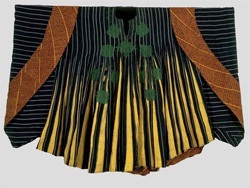 Growing up Yoruba, especially someone over sixty, a young Abiodun must have seen various celebrations for which many of these elaborate cloths in the Collection are main items. Unlike your a je butter generation, many young boys, including some from Christian homes in my generation, did not stay at a distance – as commanded by their fathers – to watch egungun, sango, and other “pagan” celebrations. While the Professor did not cut the image of one who would participate in rascally derring-dos like actually wearing egungun outfits from the little I knew of him at Ife, I do know some in his generation who did! Whether he did or not though, his grasp of Yoruba language and idioms learnt and mastered in an era when students were first taught in the Language before learning English, his artistic training AND background have all come together beautifully in Fabric of Immortality: In Praise of Gods and Cloth. Cloth makes a man so much in Yoruba belief that an Osogbo egungun (Gogoru- Gaw-gaw-roo), much feared because of its size, has this saying attached to his/its (!) rare appearance: eni t’o ba ti gbe egungun Gogoru ti di eni eru (e-roo; the ‘e’ is as in elephant). [No matter the stature – physical or social – of the man under Gogoru mask, he becomes someone to be feared because of the scary appearance. Look at it this way: one respects Nigeria’s president in spite of the deaf, blind, mute and plain stupid results of governance being aware that he received a stolen “mandate” courtesy retired General Obasanjo. I hope you note Gogoru and eru (fear), one of the seemingly ever-present assonance/alliterative and often homonymous words/phrases common in Yoruba proverbs, sayings of the wise & idioms. Listen, dear, we cannot allow a situation of your never having seen egungun or “human” dancer that wears the many-strip dandogo going beyond age forty! Plan an 09 visit around August when many towns have new yam festivals and we’ll get to see egungun dancers – or even Osun Festival at Osogbo – and the men whose dance moves, done to showcase the dizzying twirls of the dandogo, make the saying on page 45, Aso la nki ki a to k’eniyan, very apt. You wouldn’t be able to pick the dancer out from among many after the dancing stops because while he dances, your eyes are fixated on the dandogo’s incredible movements, never on his person. Sorry, cloth is more important than the wearer! A personal note about the “immortality” of Yoruba cloths: I inherited an iborun & gele set exactly the same design and colors as the one in Fig. 33 from the estate of my mother-in-law who died in 1982. While the Catalog photograph is dated 1984, I believe the cloth must be from a much earlier era. I’ve now used the set as upholstery fabrics. Parts of the gele were in tatters and after being repeatedly told at occasions – as if I did not know – that my gele was “torn”, I woke up one day and decided to cover an old harvest bench, including two small cushions with what could be salvaged from the two pieces. “Timi the Law” (Late Rotimi Williams) who wore his shredded-by-age lawyer’s gown to courts till he died had points to prove; I did not. One of my four kids, though, is already penned down as the next owner of Mama Osogbo’s old aso oke. As you’re well, dear, I’m well. Dándógó; designed for classical dance.